“Proud as a peacock” comes to mind when considering this charming and funny story of Limelight Larry. This book is going to be amazing. You know why? Because it’s about Limelight Larry. He thinks he should be famous and there should be more books about him. But then a mouse shows up and there’s definitely no room for a mouse in a book all about Limelight Larry. Then there’s a bird, and he’s not too keen on the bird trying to steal his spotlight. Or the numerous other animals who show up trying to draw the attention away from him. But is showing off all by yourself really any fun? 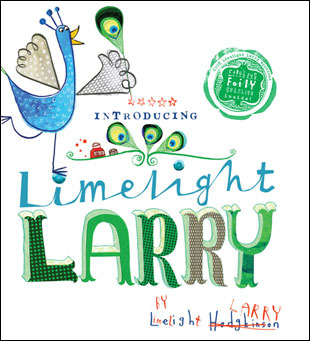 Limelight Larry by Leigh Hodgkinson is a fabulous, silly book filled with tons of equally zany illustrations that shine the light on attention getting. Through this story, kids learn in an easy way how much better it is to share the limelight with others. Its unusual and varied text captures the attention of young readers, while the numerous creatures filling its pages will delight them. This is definitely a book we’ll want to read together again! I received a free copy of this book from the publisher in exchange for my honest opinions. I received no monetary compensation of any kind for this review. We’re so glad that you liked Limelight Larry! We’d be thrilled if you’d share your review on our website, tigertalesbooks.com!